In early October of 2013, we designed a few shirts and hoodies for the Union Binding Company. This opportunity marked the beginning of a collaborative friendship that has since proven to be a forum for exchange of design ideas and brand exploration. Since those early days spent discussing brand ethics and snowboarding, we’ve branched far beyond softgoods and have been honored to be able to handle marketing design, catalog design, interactive experiences, and virtually anything requiring a designers touch. As Union Binding Company is the premier binding manufacturer in the snowboard industry, their commitment to product progression is in line with our own brand ideals. Suffice to say we couldn’t be in better company. After following up softgood design and creating a limited release binding, Noct again partnered with Union Binding Co. to create the brand book that would showcase the entire Union binding offering for 2013 / 14. 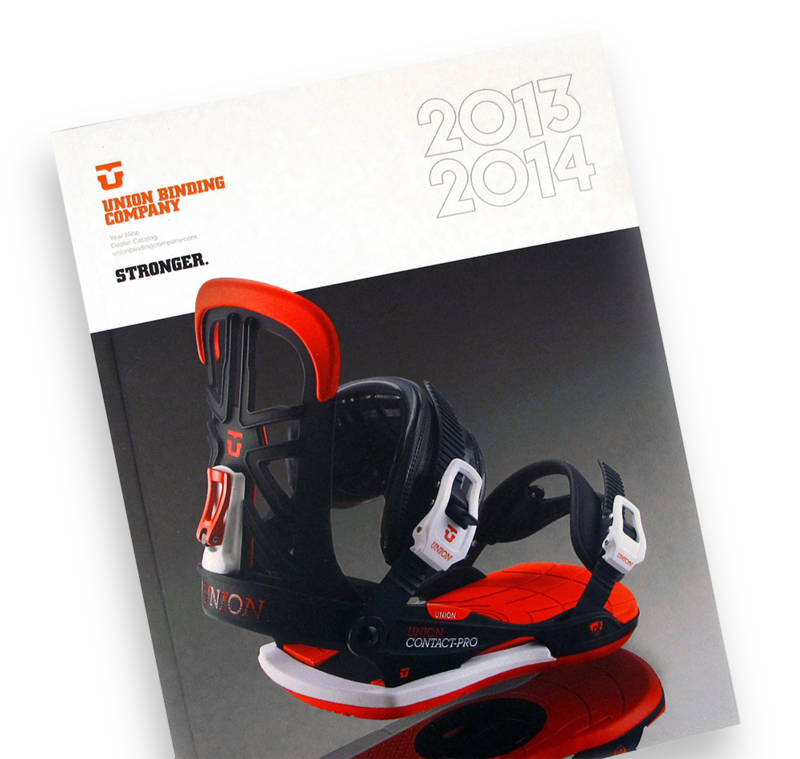 Featuring such innovative bindings as the Contact Pro and Travis Rice’s Factory, the brand book needed to be as polished and perfected as the product it represented. When the catalog fell into the hands of the Union sales team, product started moving, impressions were made, and the project goals had been realized. With some of the most beautiful engineering and product design in the action sports sphere, Union made the job easy. Moving beyond the printed page and into an interactive environment was an opportunity to expand upon the 2013 / 14 Union aesthetic. From a full company website redesign to an interactive testing ground based around the Contact Pro Binding, we are always looking at pushing the limits of the Union experience. From custom cut & sew garments to snowboard-centric fits, the Union softgood line receives the same consideration that has put Union on the map as a purveyor of quality. With an eye towards the future, we’re always looking to create the finest snowboarding garments as an extension of the Union lifestyle.